GURPS Mars Attacks will bring the infamous alien attackers to tabletops, courtesy of Steve Jackson Games and Topps. Where would the world be without Mars Attacks? Whether you're a fan of Topps trading cards, the Tim Buron film, or various comic books produced over the years, Mars Attacks perfectly encapsulates the spirit of 1960s invasion movies - along with a healthy dose of gore and subversion for good measure. 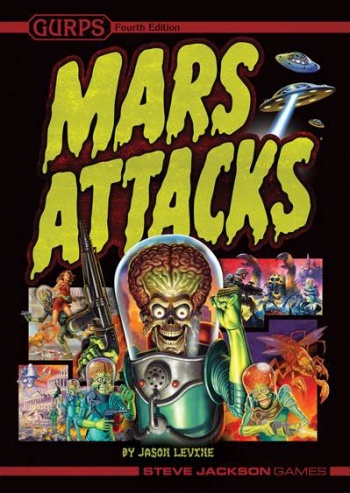 The only thing more exciting might be to play through the assault yourself - something Steve Jackson Games will allow with the GURPS Mars Attacks RPG. GURPS Mars Attacks drops you right in the middle of this iconic attack on Earth. Players can take on any role from the franchise, including civilians, Novas Vira scientists, Tiger Corps soldiers, or the Martian invaders themselves. Once your character is created, you'll load up with blasters, vehicles, flying saucers, or any other bizarre invention to wipe out your enemy. Just try to keep your infantry away from the robots and giant ants - that strategy probably won't turn out like you planned. Mars Attacks won't be a standalone product - it's designed for use with Steve Jackson Games' GURPS Basic Set 4th Edition. But the setting itself - specifically the breakdown of Martian society - will be open enough that it could be adapted into any game system. Sadly there's no official release date yet, but I can safely say this will be hotly anticipated by alien invasion and tabletop fans alike.